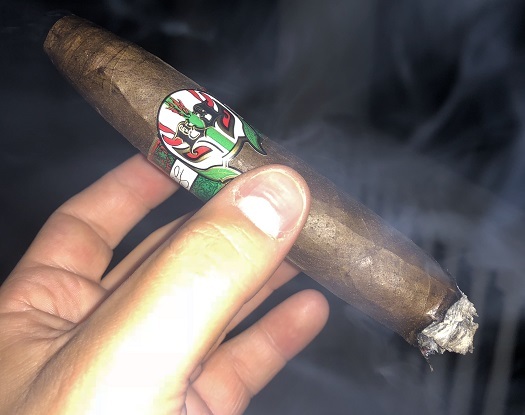 In early 2014, Sam Leccia of Leccia Tobacco announced he was “looking to put the cigar industry in a headlock” with a new blend called Luchador (Spanish for “wrestler”). In keeping with its Mexican wrestler theme, that blend was formally introduced on Cinco de Mayo. Luchador was the third line to come out of Leccia Tobacco, which also includes White, Black, and Desnudo. It features (as you’d expect) a Mexican San Andrés wrapper around an Ecuadorian Habano binder with filler from Nicaragua, Pennsylvania, and Honduras. Four regular-production vitolas are available: El Hombre (5 x 54), El Castigo (6 x 60), El Guapo (6 x 50), and Loco Perfecto (6 x 58). Each bears a red, white, and green band (think a Mexican flag) adorned with the image of a Mexican wrestling mask. A box of Loco Perfectos retails for $180.60 at the Leccia Tobacco store. The cigar I sampled for this review had been in my humidor for four years. It had potent pre-light notes of cocoa, salted caramel, and earth. The pointed cap clipped easily to reveal an impressively smooth draw (especially when you consider the firmness of the cigar). Given the narrow foot, a single wooden match is all that’s needed to establish an even light. The initial profile is one of black pepper spice, espresso, dark chocolate, and the gritty earthiness that’s so often associated with San Andrés tobacco. Past the half-inch mark, the core flavors remain the same, but the spice becomes more subdued and a creaminess comes to the fore. From there, as the Loco Perfecto progresses, the profile shifts here and there not because of new flavors, but because the flavors rise and fall relative to one another. The journey concludes with a finale that’s very similar to the beginning. Notwithstanding its solid construction and consistent combustion properties, the Luchador blend is unlikely to wow. It is enjoyable and serviceable, but falls a little short in terms of complexity or richness if you’re hoping for something memorable. That’s ultimately why I’ve landed the respectable rating of three stogies out of five.